In September we released SPACE Creative Toolbox, our third and most expansive toolbox map to date. It was designed to give players the freedom to create and explore within a pre-built world depicting competing factions and different alien environments. The ideas and inspirations for the people and planets of SPACE didn’t just come out of nowhere. 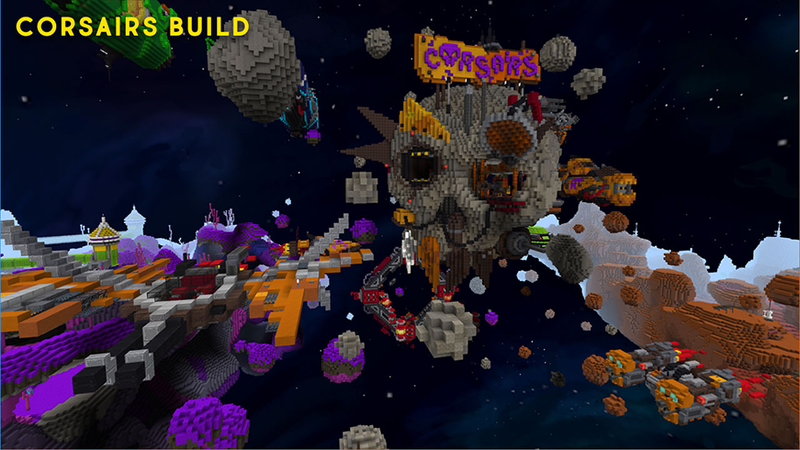 Artist Skyao and builders JakeL, Markus and e_mouse used a variety of different movies, games and stories to inspire their work and together they created their of own version of outer space. 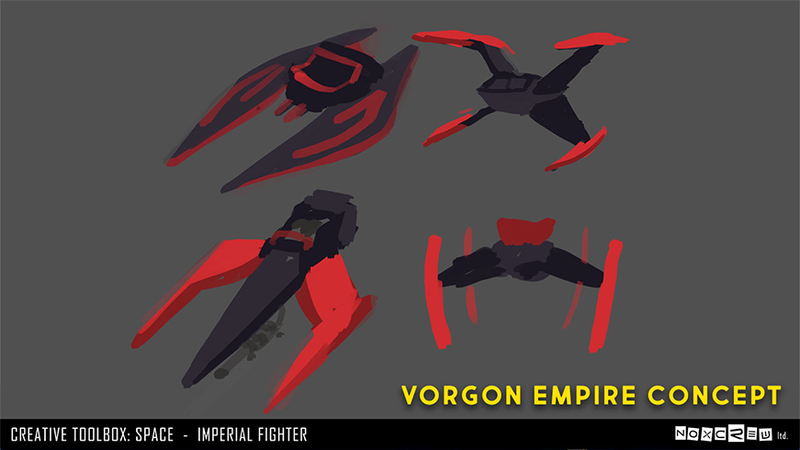 In this behind the scenes look at SPACE, we’ll take you through the four main factions: the Vorgons, Jars, the Corsairs and the Star Drill Mining Company, to give you a sneak peek at what inspires Noxcrew to create as well as the awesome concept art for the various ships, vehicles, and even the colour schemes for the different factions. From the start, we knew that we wanted to make a world that felt huge but well populated; to create the sense that this was just a small part of a much larger universe, one with overlapping narratives, conflicts and alliances. Our SPACE Creative Toolbox would be the point in space and time that these factions clashed and fought for the resources of ‘lesser’ planets. We knew we would be creating at least 3 ‘biomes’ (these eventually became the planets Uyrg, Otta and Jars) along with 3 smaller ‘zones’ which would serve as bases for the invading factions. As we discussed ideas for these factions, we decided that it would be really cool to create a giant mothership, which players could explore and create in, with different floors and sections to investigate and a story developing within it to give depth to the universe we were creating. But what theme would match a giant battlecruiser surrounded by tiny drones? An evil empire, of course! The main feeling we wanted to convey with the central mothership, which was to be the defining feature of the Vorgon faction, was the palpable sense of menace. The ship itself had to be towering and solid compared to the smaller, more functional vehicles of the other factions, with a multitude of tiny details to emphasize the immense scale of the craft compared to the drones around it. The red and black colour scheme was a given. We had a wealth of baddies throughout sci-fi to inspire our cruiser, from Star Wars to Flash Gordon, but we eventually settled on a ship built around the forward facing cannons that could destroy anything that stood before it, from starships to smaller planets. We planned sections where the smaller ships could dock to refuel or deliver prisoners and designed other, lesser weapons, for when it just wasn’t efficient to use the big guns. Everything was designed around war and conquest, with no smooth lines or suggestion of organic, natural life that one could find kindness in. With the interior of the mothership, we wanted to create a full imperial experience, stark and uninviting, yet clean and official looking, as if this is where the business of the Empire could be conducted without inconvenience or disruption, regardless of what may be happening outside in the deep vacuum of space. The white walls and stripped back furniture alluded to other such interiors such as that of the Death Star or the corridors of Ming the Merciless’ fortress. 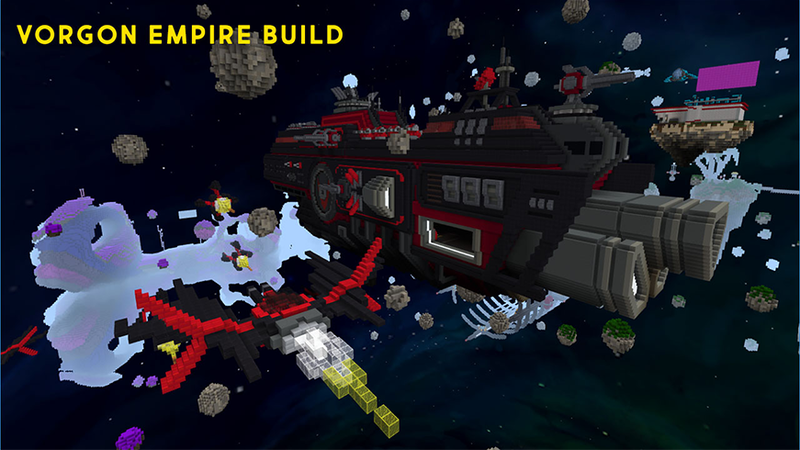 However, dotted throughout this stark, soulless environment, you will find reports from Nebulock, Captain of the mothership, Officer Blackheart and Trooper 1541, detailing the Vorgon’s endless quest to capture the infamous Captain Starboots who seems to have evaded the empire for a very long time. The documents, written in the style of secret diary entries, question Nebulock’s ability to capture Starboots, Blackheart’s ambition to take over the mothership, and the trooper’s desire to escape the oppression of the empire. This was added to bring humanity back into the clinical environment, to show that there are people who live and work in this harsh angular environment (not just mindless robots) with hopes and ambitions beyond the snapshot that SPACE provides. As you might have already guessed, Jars is a parody of our celestial neighbour, Mars. However, rather than approach Jars as Mars is now, an arid desert with minimal human interference, we wanted to explore what things might look like in our real-life future when we one day colonise Mars and create an outpost to the stars. To do this, we took inspiration from sci-fi fantasy and real-life developments from companies like NASA and Tesla to develop our own vision of the future. Since we imagined Jars as a futuristic outpost, it stood to reason that the people inhabiting the planet would be tech-savvy engineers, analysing and creating a new colony for the people of the human race. As such, Jars is built around technology, in particular, vehicles. There are a variety of mechanisms to help the scientists, and players, navigate the hostile terrain. First, we have the scouting buggies, which were at first heavily inspired by concept art found on the subreddit r/imaginarytechnology. Gradually, Skyao upgraded the design, taking details from the Lunar Rover used during the moon landing, as shown in the concept art, to link Jars back to our home planet and solidify the feeling of our future place in the universe. There’s also a pair of Zeppelins that you can spot to the side of the central base; these are designed to carry mineral containers around the planet’s surface back to the facility. During our research into the red planet, we discovered that the air on Mars is so thin that you can’t fly a helicopter or a plane there as it would be too heavy to generate enough lift to fly. Zeppelins, on the other hand, are just big balloons filled with helium, like the ones at your birthday party. Something that light would have no problems in the lessened gravity of Mars’ surface, save for the occasional strong winds that could send it off course. The vehicles of Jars aren’t just for exploration, of course. As a functional research base, the materials found on the planet would need to be handled and processed somehow. We found our solution in a mechanised suit that Markus originally built as a side project - it’s always fun to discover that these little things might come into use one day. The mechanised suit was originally designed to be more of a combat Mech, with guns and other offensive weaponry built into the arms, but we were happy to find a more peaceful use for it. It was also interesting to consider what role military technology would have in our advancement into the stars, would the military be adapted to suit the needs of the colony or would combat overtake diplomacy? Only the future can tell. As for the colours and themes for the Jars scientist faction, Skyao wanted to push the NASA-esque feel, so used a similar colour scheme, with lots of whites, yellows and blues to create a clean, crisp logo that highlighted the mission statement of the colony. Instead of the starscape in the official NASA logo, we opted for a single shining star rising over the surface of our red planet, standing for the dawn of exploration and colonisation. The Corsairs are a collection of ruthless Space Pirates who roam the universe in search of treasure, taking what they want and giving nothing back. They’re protected from the authorities by a treacherous asteroid field which is nigh on impossible to navigate safely, with their skull-shaped headquarters looking out at its heart, ready to claim all it lays its eyes upon. The initial idea for this treacherous group of vagrants came from Skyao’s love of RPGs. While the map was in development, Skyao was playing a steampunk RPG called Lady Blackbird where players operate airships to complete goals in a politically charged world of floating islands. In this world, in a patch of sky which is filled with floating rocks, pirates, evading governmental control, set up a fortress right in the middle of this tricky to navigate area. This set off a spark in our imaginations! If sky pirates inhabit floating rocks, of course, space pirates would hide out in asteroid fields, somewhere just as difficult to reach! 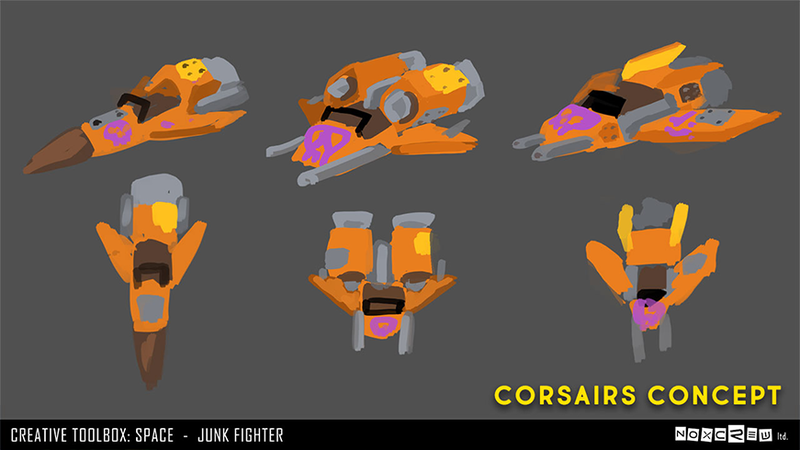 As we built and developed the Corsairs’ look and style, a loose backstory was created. These pirates, much like their seafaring ancestors, were a mismatch of all the different bits and pieces they had stolen, using junk and stolen parts to cobble their ships together. Skyao even took one of the Vorgon imperial fighters and remade it to appear as if it had been re-purposed for the Corsairs own ends! The Corsairs zone was just going to be a simple asteroid field with a massive skull-shaped rock where the space scoundrels lived. However, JakeL took the concept and created the skull fortress you see in the map today, with pieces of jagged black iron jutting out of it. This took the concept of the Corsairs in a completely different direction than the one we had intended, moving away from a stereotypical pirate style, to a junkyard aesthetic. From then on, the Corsairs became more inspired by the orcs of 40k and ‘Junkertown’ map from Overwatch, with rusted yellows, oranges and browns contrasted by the colourful graffiti tags of their logo. Originally envisioned by JakeL as a simple mining base, the Star Drill Mining Company evolved into a fully fledged mining organisaton who aim to seek and export rare ore throughout the cosmos. This small contingent of ships is merely one part of a large corporation, with larger goals in mind. Inspired by the style of the co-op shooters like Deep Rock Galactic, we decided that, rather than focus on flair or symbolism as we had with the Corsairs or the Vorgons, the Star Drill Mining Company would be a completely functional faction. To develop this functionality to the ships and station, we first needed to decide on a main goal or mission for the company, and how they might accomplish their goals. We knew that Star Drill were seeking rare ore, but what would a mining company need to do to function as a business? Would there be drilling vessels and if so, would they be burrowing machines or excavators? How would they blow up sections of rock to reveal the ore below? How would they store the ore once they extracted it? In order to answer these questions, we needed to look into how one would complete those tasks in real life: what particular tools would be used to complete the task and what they looked like. We then morphed those real-world tools into the space vehicles and ships that an outer space mining company would need to complete their tasks. With the practical elements of the company completed, Star Drill needed a logo; something to bind them together under one corporation, not only to ensure that the builds didn’t just look like random ships floating in space, but also bring character and depth. You can see examples of this sort of world-building through corporations in games such as the Borderlands franchise, who have 12 distinct manufacturers in the game that create the weapons that players use throughout the game, such as Atlas and Maliwan, who were a big inspiration when looking at the corporation and what it would look like. When we finally started to create Star Drill’s logo and aesthetic, we decided on blocky text and bold colours with a gear behind it. This was so we could immediately present to players what Star Drill is about, industry and technology. We felt that the stripped back design and easily identifiable symbols further enhanced the functional, industrial feel of the fleet creating a company with products and an ultimate goal, rather than a collection of random ships. The rare ore being mined by Star Drill is, of course, just a stand-in for stereotypical minerals that can be found in films, such as ‘Unobtanium’ from Avatar or ‘Adamantium’ from the X-Men series, serving as the driving focus for the Star Drill Mining Company - to seek out pockets of this material and transport it back to their factories for distribution. Interestingly enough, both e_mouse and Markus began implementing the concept of a rare, glowing ore for their respective planets - each builder was put in charge of landscaping their particular planet or faction - at the same time, unbeknownst to each other! Both used very different techniques to try and implement the concept, Markus used glowstone and e_mouse used sea lanterns covered in green glass. Since Markus is the lead level designer, his method was adopted and glowstone was retextured to create the gooey green glow that can be found in SPACE today. Thanks for joining us on this behind the scenes peek at Noxcrew’s creative process! 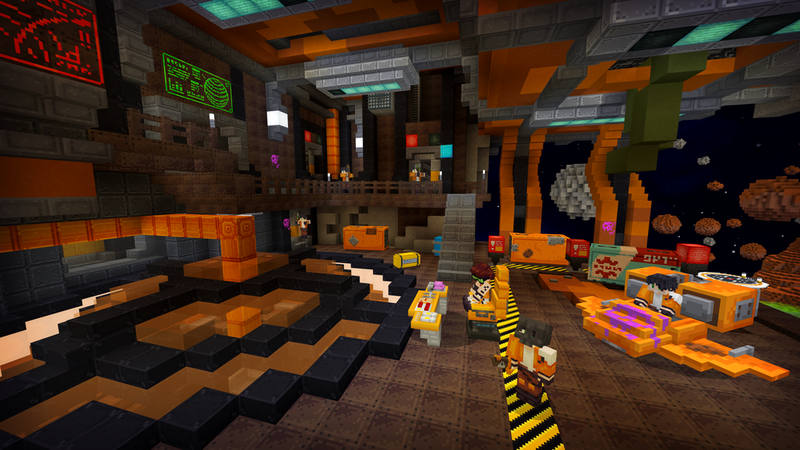 Don’t forget, you can pick the map up from the Minecraft Marketplace right now. Comment down below to let us know which was your favourite SPACE faction and which map you’d like us to lift the curtains on next time!